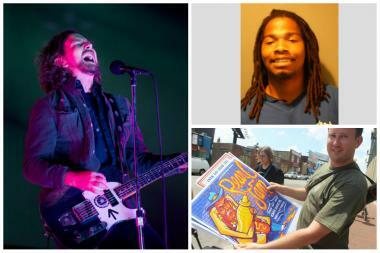 (Top right) Anthony Conner, 21, allegedly tried to sell two fake Pearl Jam tickets for $500, according to prosecutors. Pearl Jam plays at Wrigely Field on Friday. CHICAGO — Lollapalooza and Pearl Jam concertgoers beware: Fake tickets to some of Chicago's hottest shows are being sold online, and a man was arrested Friday for allegedly trying to sell two counterfeit Pearl Jam tickets for $500. Anthony Conner, 21, of the 9500 block of South Normal Avenue, allegedly tried to unload the tickets to a man he met via Craigslist. The victim met Conner at a gas station and noticed the "bar code appeared to be off" on the tickets. When the victim confronted Conner, Conner produced a document and claimed it was a receipt from Tickets.com, according to prosecutors. The victim flagged down an officer, and Conner was arrested. He appeared in bond court Friday. Conner was released on his own recognizance and could be heard saying, "Thank you, Jesus," as he was led out of the room. "To buy tickets off the street from some individual, you're taking a lot of risk," a Chicago Police Department spokesman said. "Especially if you're gonna be paying a conservative amount for a set of tickets that's too good to be true. It probably is." The police spokesman said that before paying for the tickets, buyers should see whether the ticket is printed on sturdy paper, like card stock. Legitimate tickets will have perforations and feature bar codes and serial numbers, the spokesman said. If you're buying multiple tickets at once, make sure the serial numbers are all different. Buyers can also call a site like TicketMaster and ask it to verify that the serial numbers are real, the spokesman said. Matt Gonzalez, 36, and his friend, Scott Davison, 38, stopped by Wrigley Field — along with hundreds of others — to buy Pearl Jam souvenirs on Thursday. Gonzalez said he paid $80 for his tickets through the Ten Club, a Pearl Jam fan club, and Davison paid $400 through a friend via an online vendor. "I'm confident I didn't get scammed," Davison said. "We guarantee our tickets, and when buyers purchase from Craigslist or similar sites, their risk of counterfeit tickets increases," said Shannon Barbara, a spokeswoman for StubHub. Pearl Jam will play Wrigley Field on Friday. Lollapalooza is Aug. 2-4 in Grant Park. "Everybody wants a ticket, and they all sold out fast. So now tickets are gonna be at a premium, so of course that means people are gonna want 'em," the police spokesman said. "So now they're gonna be paying a decent amount, and they're gonna get bogus tickets."